Find two books of equal height and place them together, allowing a small gap for the staple to come through (see picture below). 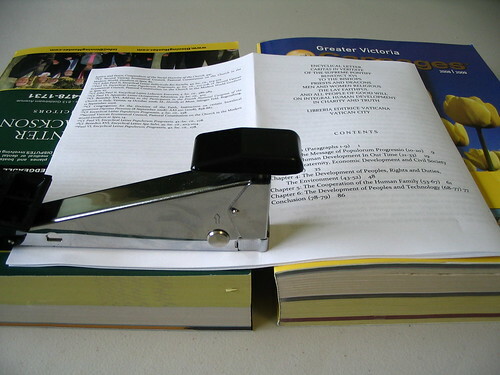 Open the stapler and pound the staple through the booklet, into the gap between the two books. Flatten the staple legs using a hammer or any hard object. posted by Jonathan at 7/12/2009 03:17:00 p.m.
By Anonymous, at 12/14/2009 3:01 p.m.
By Jonathan, at 12/14/2009 10:03 p.m.
By Baljeet Kaur Samra, at 5/14/2011 10:27 a.m.
By Jonathan, at 7/21/2011 7:19 p.m. Thank you so much!! I had to make Safety Booklets for our cub scouts and this was prefect! By nancy_kent, at 11/20/2011 1:55 p.m.
By Jonathan, at 11/20/2011 5:57 p.m.
Great, so glad for this solution! By Anonymous, at 8/02/2012 11:43 p.m.
By Anonymous, at 11/19/2012 2:07 a.m.
or just staple to a cork board, pull it off the board and flatten the legs. By Anonymous, at 12/28/2012 8:17 a.m. Thanks so much, this is great! PS - A good knife is ideal to flaten the legs with. By Katty, at 1/13/2013 5:40 a.m.
Wow this works very nice indeed! By Anonymous, at 4/13/2013 1:41 a.m.
By Anonymous, at 10/03/2013 8:51 a.m.
By Anonymous, at 11/20/2013 7:41 a.m.
By Katrin, at 11/26/2013 1:39 a.m.
By ashley sanders, at 2/08/2014 2:22 a.m. Thank you! it's effective and cheap. By Anonymous, at 2/26/2014 8:38 p.m. Thanks! I like the document you used as an example. I came here to figure out how to staple a booklet on the Rite of Eucharistic Exposition. Imagine my surprise. lol! By Carol, at 6/03/2014 12:34 p.m.
By Jonathan, at 6/03/2014 7:48 p.m.
By Anonymous, at 9/25/2014 6:53 a.m.